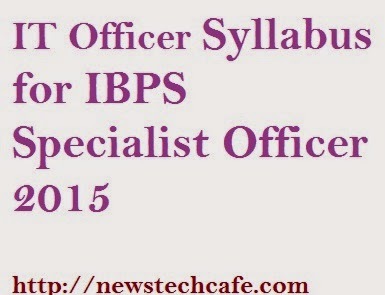 You all are waiting for IBPS Specialist Officer 2015 which is Starting from 14 - feb - 2015.And you all are waiting for the Syllabus for IT officer exam. So we are sharing IBPS IT officer exam syllabus today. IBPS IT Officer consists of 200 Questions (Reasoning - 50, English - 25, Quantitative Aptitude - 50, IT Professional Knowledge - 50) and each question of IT Professional Knowledge is of 1.5 Marks (IT Professional Knowledge Mark = 50 x 1.5 = 75). We are providing the list of important topics which cover major portion of professional knowledge section. It will give you insight into the professional knowledge part so that you can prepare accordingly. .